The RedMere® Integrated Chipset found in any RedMere® HDMI® cable is the magic that allows the great picture quality over longer distances with a far superior, thinner, and lighter cable. These cables provide all the capabilities of HDMI® such as 3D, 4K, Ethernet and Audio Return Channel, and allow for sustained data transfer speeds of up to 10.2 Gbps. The RedMere® chip draws the current it needs from the HDMI® source (such as your cable box or DVD player) which eliminates the need for an external power source, and this allows less copper to be used in the cable allowing for a thinner and more flexible cable. 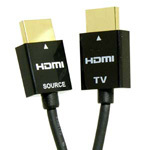 They are great for thin wall mounted TV's with minimal space in between the wall, longer distance runs, and for connecting portable devices such as smart phones, laptops, or portable video gear.